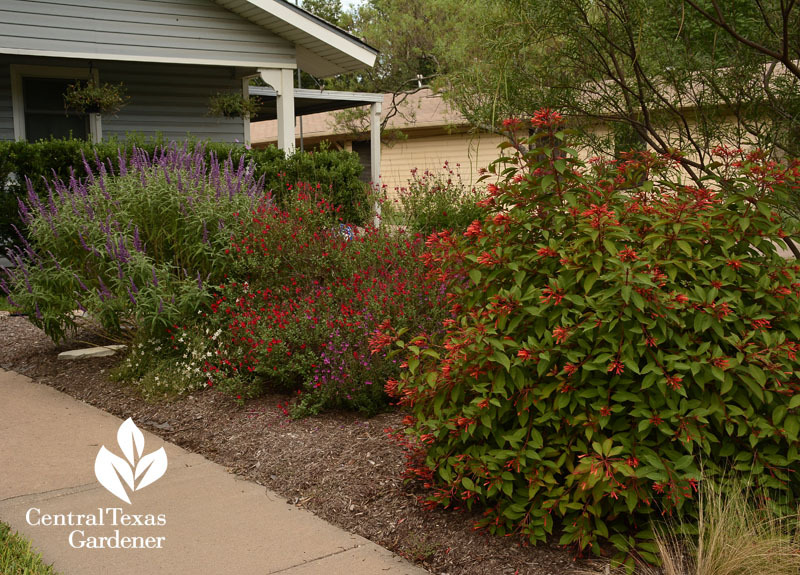 What’s the BUZZ About Native Plants? 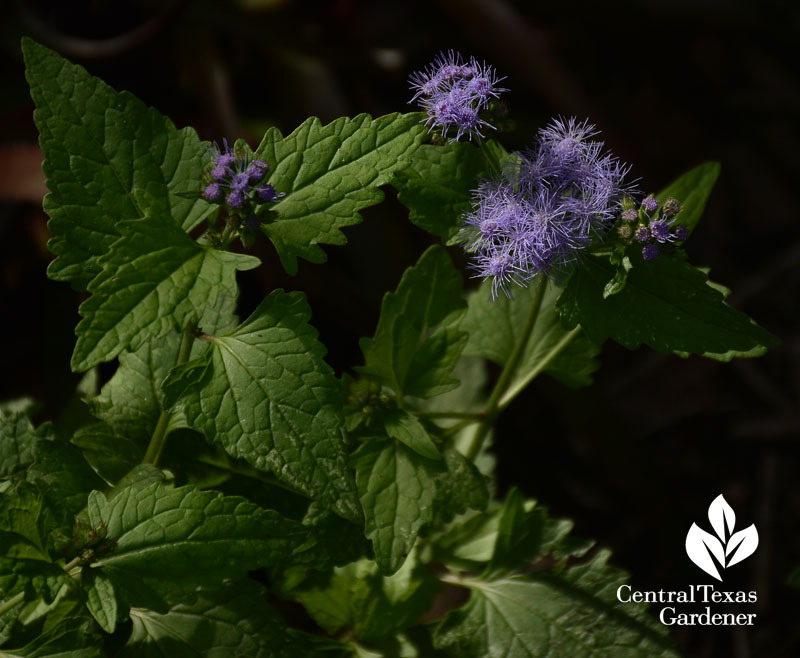 Adaptable, rambunctious native Conoclinium coelestinum—one of a few called blue mistflower—is on target for the usual flock of butterflies (let’s hope). Boy, it’s been a rough year. Since winter’s 12° and drought, it’s the first time that my Salvia greggiis have wimped around. After recent rains, they rallied to get back on the job. My new native gray golden-aster (Heterotheca canescens) pumped out its first tentative flowers. I’m not sure I have the right spot for it, but I had to try after meeting it on our visit to the Commons Ford Prairie Restoration. 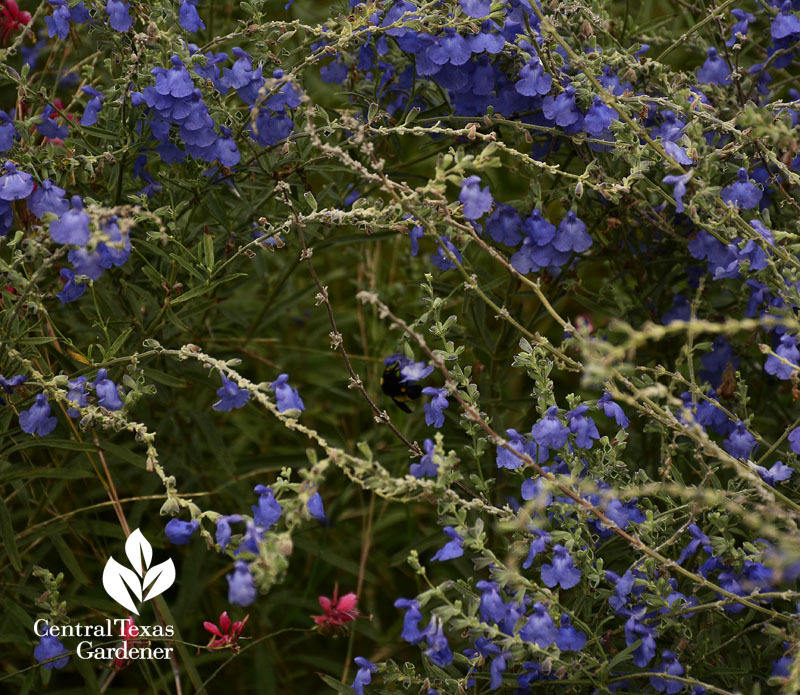 With Texas Native Plant Week around the corner—October 19- 26—now’s the best time to plant our native perennials, like pitcher sage (Salvia azurea). Bumblebees are going nuts on this one a few blocks from me. 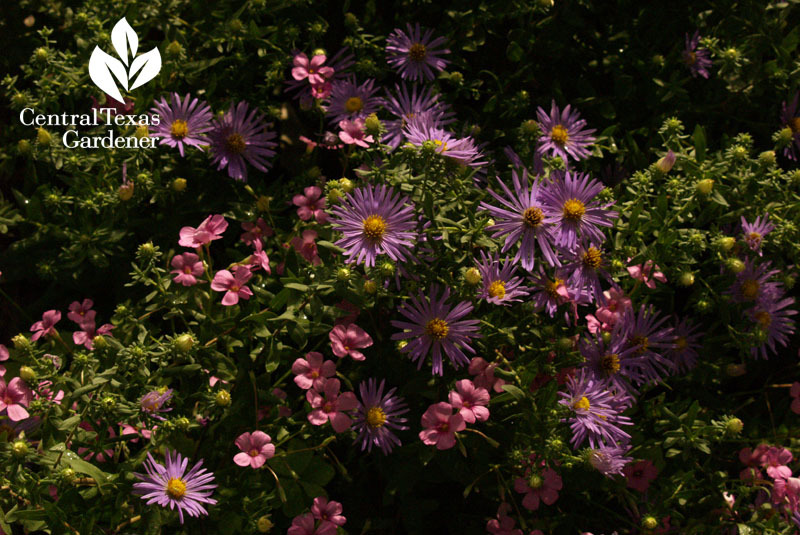 Why is it so important to include native plants in our gardens? 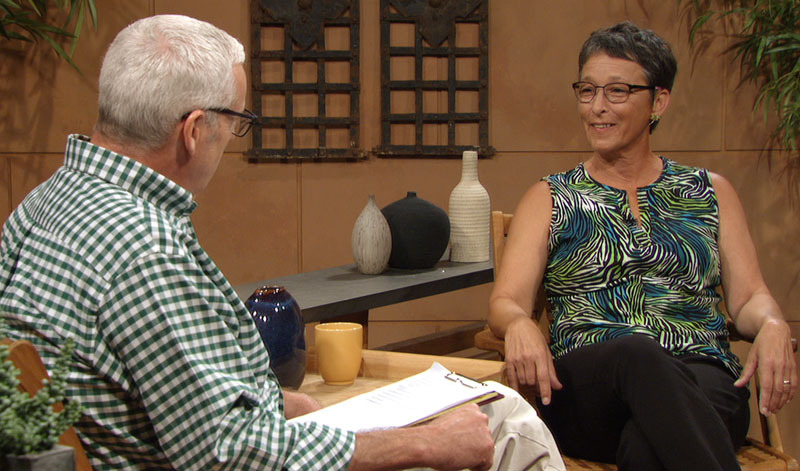 Cathy Downs from the Native Plant Society of Texas joins Tom to tell us why with some starter options. You don’t need lots of room. My neighbors solarized their lawn all winter a few years ago to kill it without chemicals. After adding compost, now they’ve got a perennially pretty spot for everybody, even in this small spot. Here’s a view of desert willow, Hamelia patens, Salvia greggii, Salvia leucantha, blackfoot daisy and Mexican feather grass. 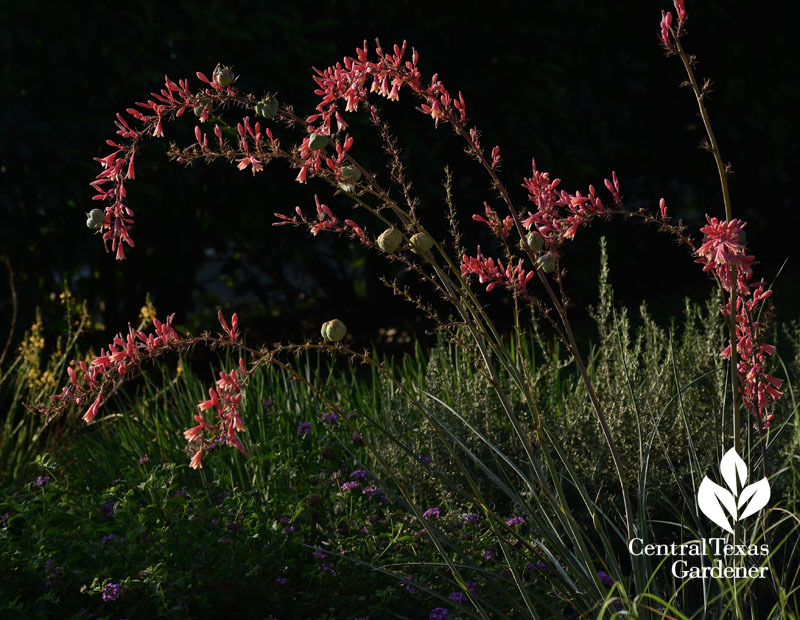 Deer-resistant evergreen red yucca (Hesperaloe parviflora) blooms from spring to fall, speeding those hummingbirds back to our zip codes. Need an evergreen vine? 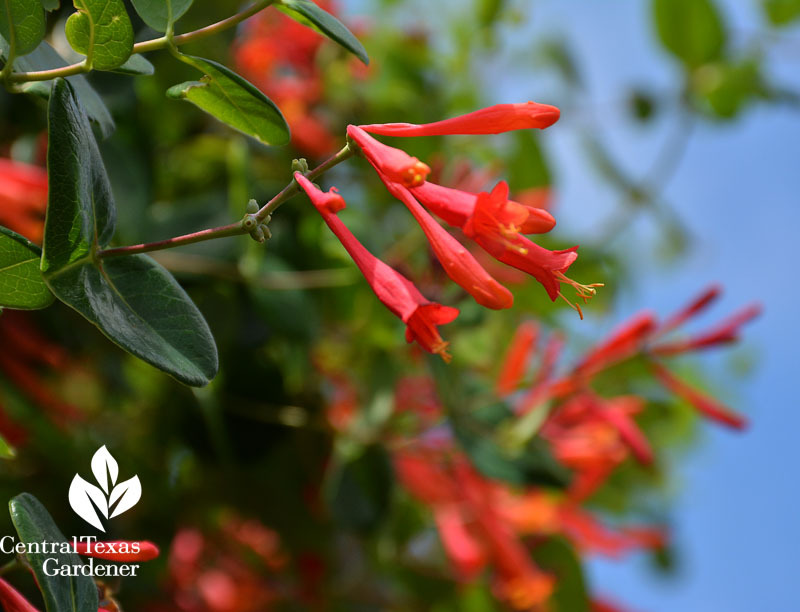 Check out coral honeysuckle that entices butterflies and hummers in early spring to summer. Got shade? Let’s add some perennial frostweed (Verbesina virginica). It’s a great woodland plant for us. Mine is just starting to flower. I hope to attract butterflies like in Cathy’s picture. Cathy encourages us to become Monarch Waystations. 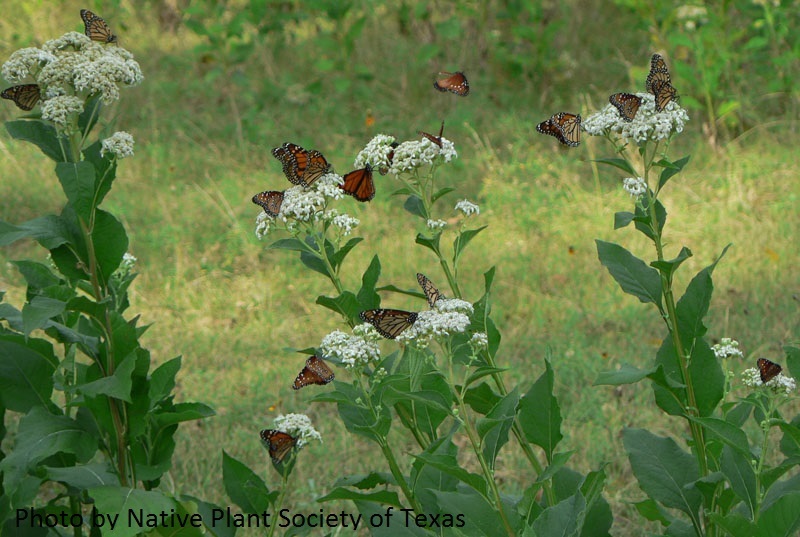 It’s easy to make it official but all you need are nectar plants, milkweeds to lay their eggs, water, and shelter. 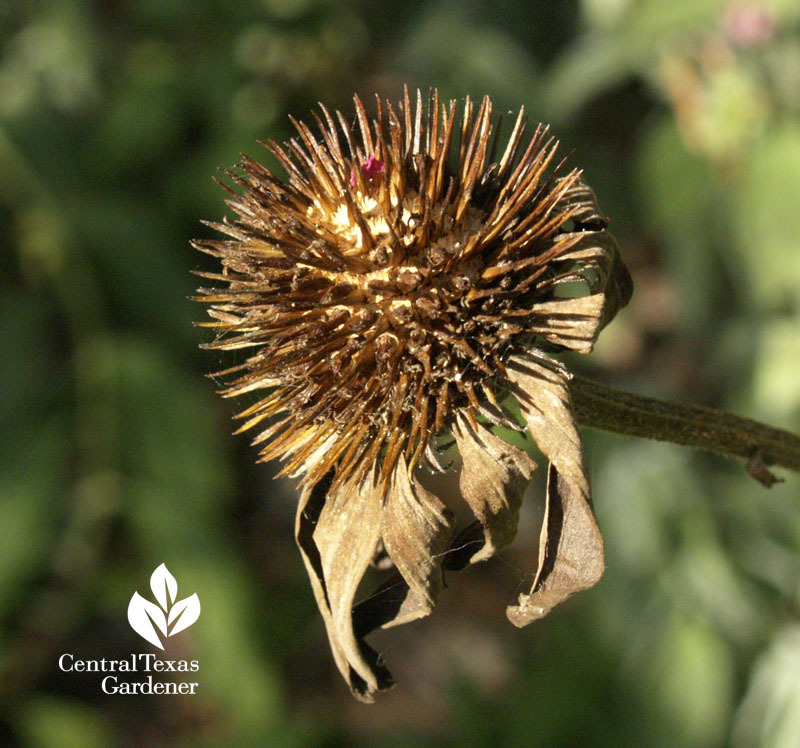 Birds treasure those seeds you’re not quick to clean up, like from coneflower. 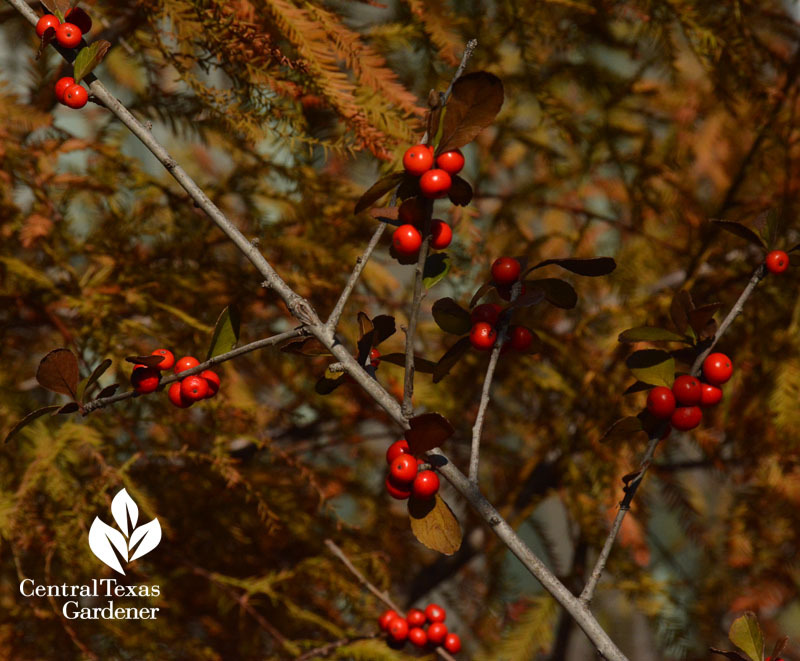 When possumhaw holly (Ilex decidua) loses its leaves in winter, it stages a show for birds that claim its berry wonderful nutrition. Now, isn’t this lawn just lovely? The house has been up for sale for weeks, sans irrigation. 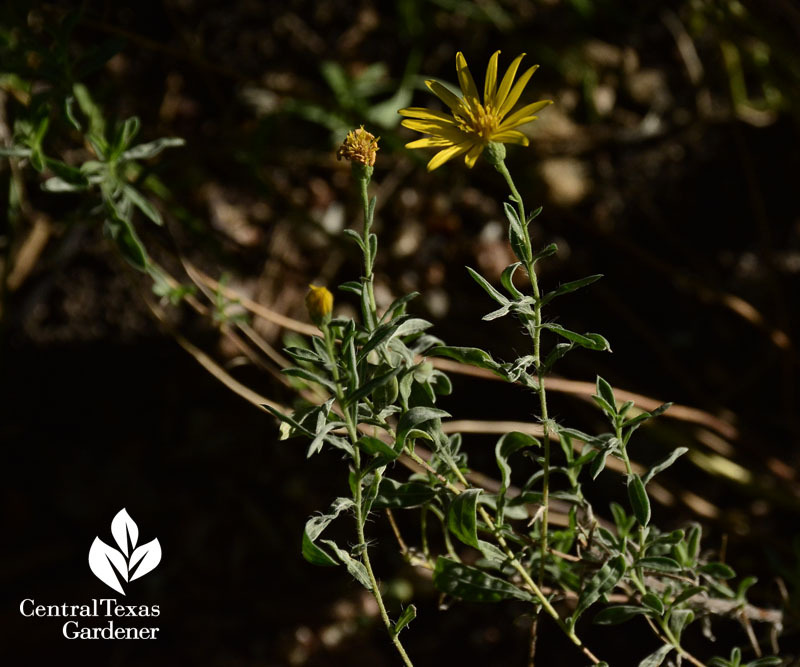 Native horseherb, also called straggler daisy, fluffed out with the first rain. 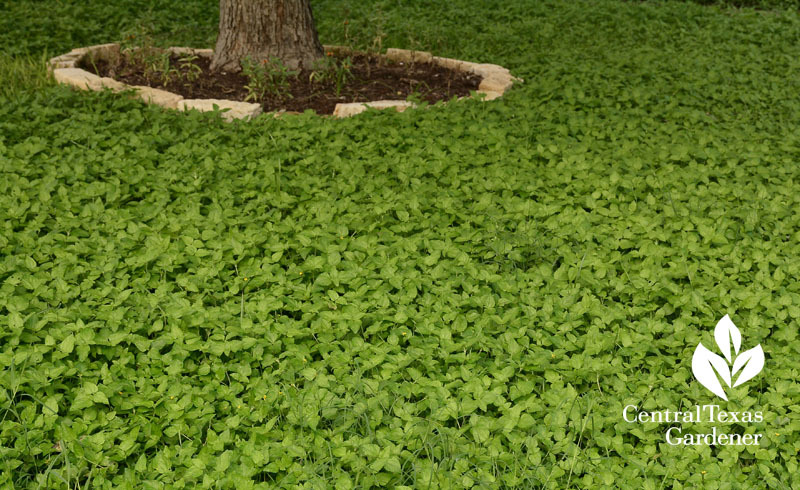 This no-mow lawn, that attracts little pollinators to its tiny flowers, is so dense that it’s smothering anxious weed seeds underneath. BUT: let’s not mulch around trees like this! More on upcoming CTG. Mexican-native pink skullcap is easy to find. You have to look around a bit to get native skullcaps, like purple skullcap (Scutellaria wrightii), Daphne’s Plant of the Week. 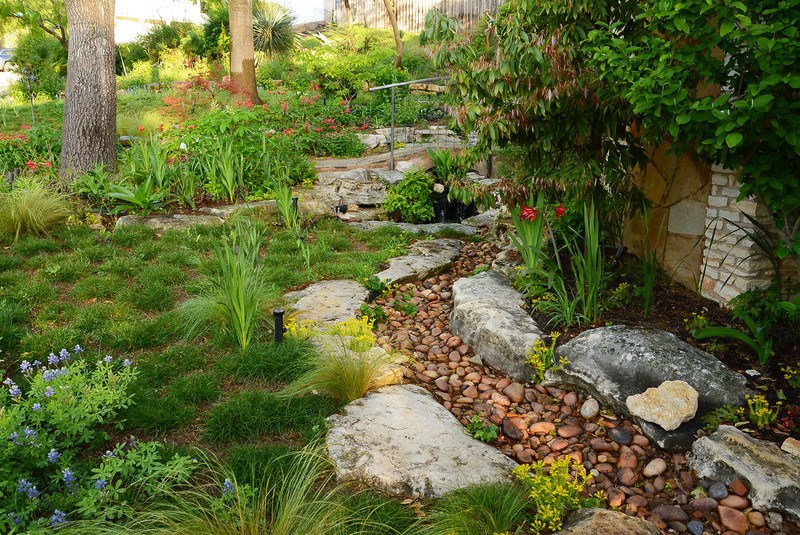 Jenny Stocker’s plants illustrate that it wants sun to some shade, along with good drainage. So, you’ve got all these great flowers and you’d like to frame them or turn into gifting bookmarks. Viewer Kim Bruch details how she laminated hers to share with her elementary school students. Viewer picture of the week goes to Robin Mayfield for her Senna corymbosa. Although native to South America, this drought defiant small shrub/tree attracts lots of pollinators. On tour, visit Jenny and David Stocker’s garden where native and adapted plants unite for wildlife and delightful outdoor living! Salvia farinacea joyfully re-seeds all over Jenny’s garden to keep up with its wildlife customers. They built this comfy incubator for pollinator-powerful Mason or solitary bees. 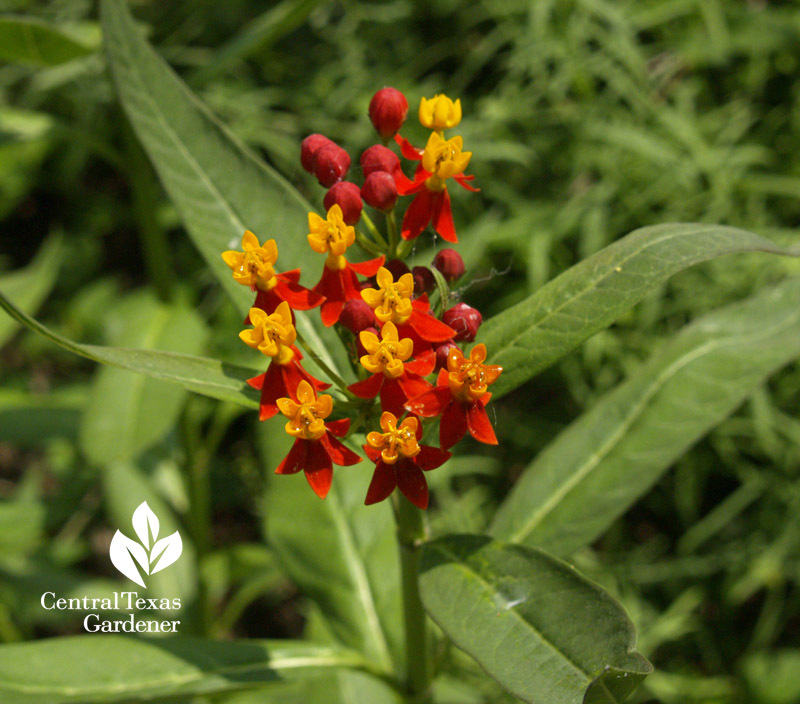 Oct. 18- 19: At Zilker Botanical Garden, celebrate The Austin Area Garden Center’s 50th Anniversary celebration with plant sales & more. The First Austin African Violet Society will be there, too, selling lovely African violets to enjoy indoors.